If you are looking for a way to beautify your home while enhancing its energy efficiency, wood shutters are an excellent solution. Wood shutters are beautiful and fit in with many décor styles. Whether your home is ultramodern, shabby, chic or somewhere in between, we’ve got you covered! 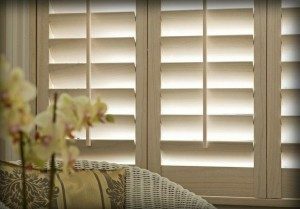 Plantation Shutters are the most timeless coverings you can put in a window as well as literally being the only Window Covering product that can actually increase your home’s value. While shutters may originally have started out as a functional addition to the home, as time has gone on, they have taken on a more decorative role. At Starwood Window and Floor Coverings, we are proud to say that our shutters are as practical as they are beautiful. 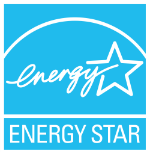 • Temperature control…your home will stay cooler in the summer and warmer in the winter. • Wood shutters control air flow, light, and privacy. • They give a sophisticated and elegant look without going overboard. • They are an affordable option that comes in a variety of colors as well as materials for greater versatility in options. • They are easily maintained and reliable. An ATTRACTIVE look, at an Attractive Price! 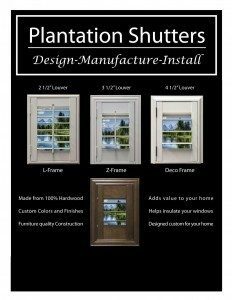 Elegant, custom plantation shutters, made from top quality hardwood. Shutters from Starwood Distributors, quite simply put, are the finest shutters available today. 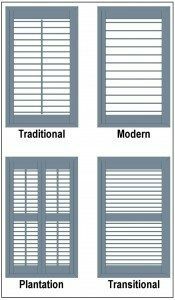 Today’s wide variety of fun and functional shutters may make it difficult to choose just one style! If you’re not sure what style of shutters to go for, start by thinking about your room. Do you want more privacy? More control of the light from your window? Insulation from outside cold or noise? Or a combination of all three? In addition to a full line of styles, we also offer louver sizes ranging from 1 7/8″ to 4 1/2″. 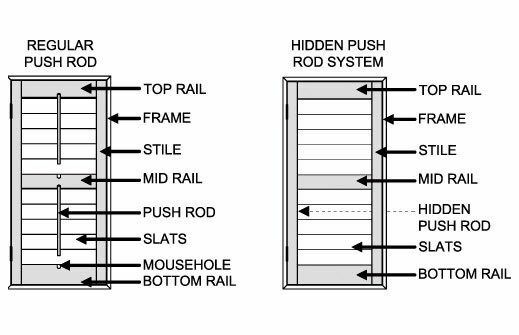 There are several options to control the tilt of the louvers on your shutters. Front Tilt Shutters are most common. Front tilt shutters have a bar on the front of the shutters to control the louvers. Rear Tilt Shutters hide the tilt bar. This provides a cleaner look, while still easily manipulating the louvers. Hidden Tilt Bar Shutters hides the tilt mechanism away behind a corner of the louvers. This provides a truly clean look, with no bar at all. Split Tilt Shutters offers more control to the homeowner, by allow control of different section of the shutters independently. Starwood Window and Floor Coverings provides the highest quality interior plantation shutters with distinct styles to choose from. 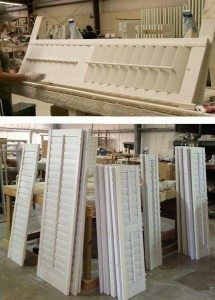 Our custom plantation shutters are available in both Wood and Poly/Faux wood material in a multitude of color options and can be custom built to fit virtually any opening; regardless, the size or shape. We also can make custom shutters to fit arched windows, sliding glass doors and other specialty shapes. We can accommodate any shutter to fit with your interior design. We proudly serve the Dallas, Pla no, Fort Worth, Austin, Houston and San Antonio, and surrounding areas. We guarantee the lowest possible price and will beat any local competitor’s bid. It’s as simple as providing us your invoice from the other company on their company letterhead. 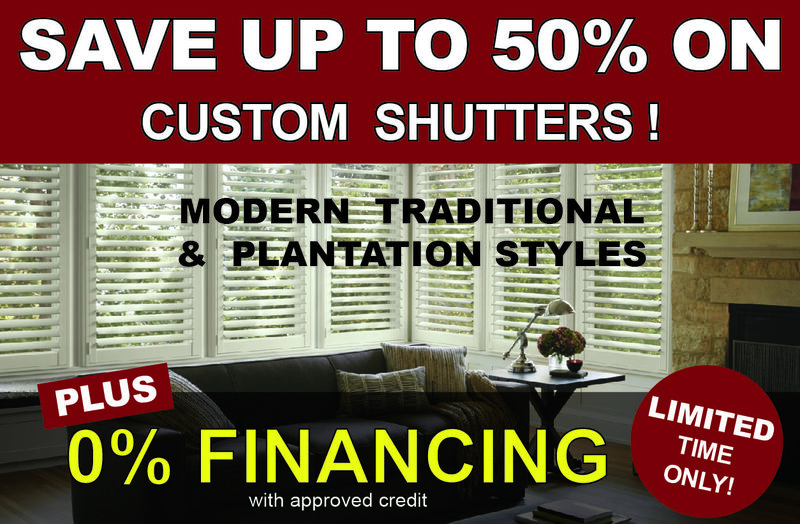 If you would like an estimate for custom shutters please call us today for a Free In-Home Consultation or complete our online request form. 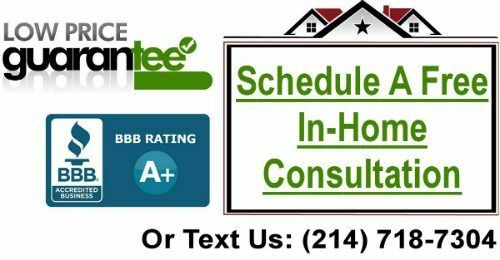 Book a FREE In-Home Consultation Today!